I came to Nepal from America seeking answers. It was easy to see from their songs, their smiles, and the sparkles in their eyes that the people here had some sort of secret, they got it, they figured it out. I wondered what it was. I recently had a special chance to search for what I was seeking. 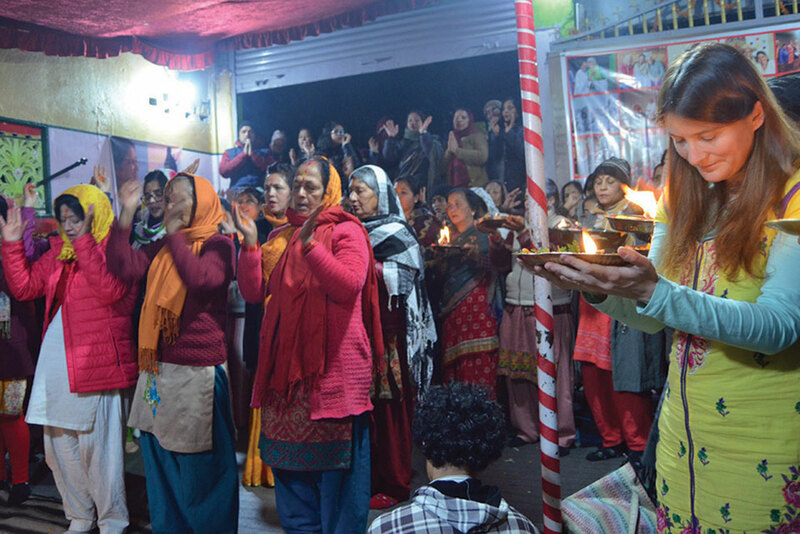 I had the honor of witnessing 11 days of Shivafest, a celebration of exploration towards Shiva consciousness and bliss, at the Shiva Yog ashram. Before the festival, I asked about Shiva. I was told that Shiva is a part of the Hindu Trinity and is one (and all) of 84 million Hindu gods, each with 1008 names. Each god, like each of us, is a window to the same sky, inside and above. We are all Shiva. Shiva is an enigma, the beginning and end, everything and nothing, matter and energy, masculine and feminine, movement and stillness, form and formless, the definite and infinite, me and you. Shiva is the all encompassing source and soul of universal consciousness. Shiva is the embodiment of all the stories ever told and to be told. I was told that at Shivafest we would enter as ourselves and emerge as Shiva. We welcomed special scholars to translate the ancient Sanskrit poetic text, the Shiva Mahapuran. They say that Sanskrit manifested through Shiva consciousness. Each day up to four hundred people flooded the ashram to hear these stories. We started off the first day with a water ritual, where we took our celebration to the community and the temples. The rest of the festival was full of rituals, reflecting the five elements, as reminders that the microcosm reflects the macrocosm, and the divine inside is the divine above. The sacred space was set up in a trinity. There was the main hall, with mandalas and yantras, where we shared stories and songs. There was an outdoor space where we made our offerings to the fire. The kitchen also played an important part as a place to practice giving and receiving love, and it was there that the collective consciousness came together to feed the community. The story was told in cycles of three. We started by listening and surrendering to it. When we finished a section, we were integrated into it and tuned to it by singing songs and becoming the song and becoming one. From there, we were ready to go deeper inside, where we had a chance of catching a glimpse into the story. It turns out that this glimpse is the story. I was told that the book isn’t about the 24,000 verses. If we can hear four words from the four directions, and if we can be here now, there may be a moment when we can catch where the words come into contact. This is where we can become the Sadashiva, the ultimate form of Shiva. My own Shiva Mahapurana is happening inside of me, and it is mine alone, it is my question and my answer. It asks if we are willing to witness our truest selves and wake up from this dream. In this moment, the candle is blown out, and we can become the essence. This is the meaning of nirvana. I witnessed this spark, this flame and this essence. Through the process of witnessing I went through my own form of transformation. Throughout the festival, I took thousands of photos. My camera became my open eyes and mind and heart. I captured a reflection of myself and how I saw beauty and how it saw me. I caught a glimpse into the great mystery on the other side of the mirror. At Shivafest, I saw our true selves reflected on the mirror of awareness. I saw a transformational alchemy forged in the fire. I saw bells ringing in a ritual reminder. I saw a flowing and flowering dream and an awakening. I saw a blossoming from the seeds of surrender. I saw hands reaching for the stars that we came from. I saw everyone’s energy resonating together. I saw a radiant light shining from a connected channel from one heart, one smile, one song, one dance, oneness. In our songs and dances, I saw a prayer that was higher and healed our pain. I saw a prayer for the whole world and all the worlds within it. I saw people at peace in a meditation in the midst of the madness, which seems symbolic of Nepal’s part in the world. And I saw an answer. I saw that the people here are able to live such spiritual lives, because there are so many gods, because there is a god for everyone, because they are seeking god, because they are seeking themselves because it is all about the journey. In movement there is life. In movement love and light can flow. In movement there is surrender. In movement there is freedom. Just as Shiva dances, as birds migrate, as flowers bloom, as everything grows, and as rivers flow and move mountains and shape valleys and shine stones so you can see the crystal inside. And in stagnation there is suffering and sickness and death. Think of what happens when a river is blocked by a dam or what happens when we don’t know how to grieve and let go or what happens when we shut down and harden our hearts. Look what has happened in the West. Maybe in religion as we know it in the West there is a lack of movement and in spirituality there is the dance of life, there is poetry in motion, like the Mahapuran. It is an endless dance of life and death of questions and answers. My friend said the secret, like love, can’t be explained and can only be experienced. And it’s all the same secret. And I already know it. I just have to remember. At Shivafest, I experienced a story that sparks this remembrance. We were telling a story that transcends time, a story that we all wrote and are writing together, a story that is a map to navigating our being, a story that weaves us into the web of life, a story that is the key to unlocking miracles, magic and mystery, a story that heals, a story that is true. And it is indeed a love story. And the world needs your love and your prayers. Sussman is a teacher and lifelong learner from California. She recently attended 11 day Shiva Purana in Bhaktapur.